A football player at Jonathan Law High School in Milford received a surprise to remember on the 50-yard line Friday night. Cole Egersheim, a senior tight end, thought he was just taking the field for the football team’s first home game of the season. Little did he know that his dad, Joe, who's been deployed in Kuwait for the last year with the Army Reserve, was at the game too. Joseph Egersheim was there to surprise his son and was disguised as one of the game’s referees. “I just looked down and started crying. I haven’t seen him in so long. 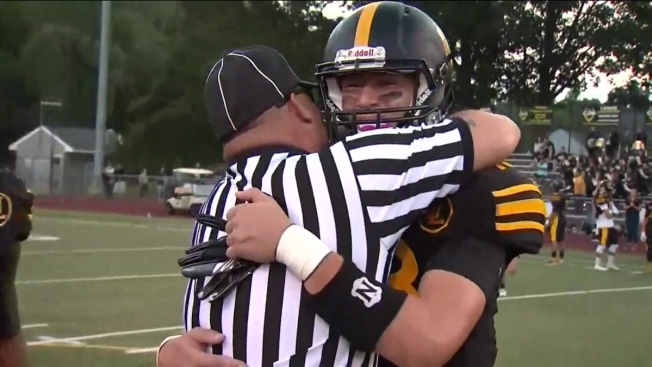 I missed him so much,” Cole said after he spotted his father during the opening coin toss. Fresh off of a flight, Joseph Egersheim tried to keep a low profile in sunglasses and a referee uniform before the game got underway. For him, being able to surprise his son in this way was an experience of a lifetime. “I was so nervous. I couldn’t believe it. I loved it. My heart wouldn’t stop pounding,” Joseph Egersheim said. “It all worked out. It just was great. It made him feel so good,” Joseph’s wife and Cole’s mother, Robin Egersheim, said. Two of Joseph Egersheim’s children were at Friday’s game. Cole’s twin sister, Olivia, is a cheerleader at Jonathan Law and was also in on the surprise. “To make him happy on his first home game, it was good,” she said. With fans in the stands and his family there to cheer him on, Cole said he’s thankful to have his dad and his service to his country. Now that their dad is back, the Egersheims are looking forward to getting back to normal life as a complete family.